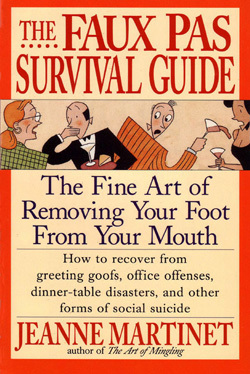 A hilarious guide to recovering from greeting goofs, office offenses, dinner-table disasters, and other forms of social suicide. It can happen anywhere — at a cocktail party, in the Laundromat, at a business meeting, on an elevator: that most unpleasant of all human errors: the faux pas. Even the most confident conversationalist has experienced the embarrassment of getting someone’s name wrong, mistaking someone’s sister for her mother, making an off-color joke in a decidedly “on-color” setting, asking about a plump person’s upcoming “blessed event” when the person is not pregnant, or committing one of dozens of other foot-in-mouth fumbles.